March 21, 7:00 pm, Readers’ Delight, discussing The Moonstone by Wilkie Collins. The next book will be The Hare With THe Amber Eyes by Edmund DeWaal; contact the library if you would like to borrow a copy. March 22, 10 am – noon, Coffee Hour, Join us for a cup of coffee or tea, a sweet or two and good conversation. March 25, 6:30pm, Peacham Knitters. Bring your knitting or other handwork for an evening of creativity and chatting. New knitters are welcome to come for help and encouragement. March 29, 10 am – noon, Coffee Hour, Join us for a cup of coffee or tea, a sweet or two and good conversation. Suitable for all ages! 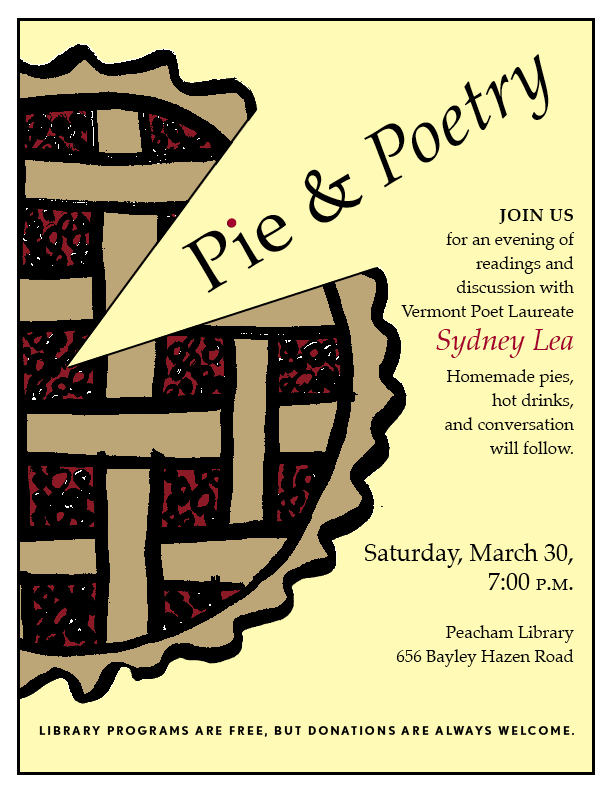 March 30, 7:00pm, Pie and Poetry with Sydney Lea, Vermont Poet Laureate and author of eleven collections of poems, along with several prose books, will speak on poetry as “another way to knowledge.” A feast of pies will follow. Read the 2013 Town Meeting Newsletter. Friends of Peacham Library will be participating in the Flea Market on April 27. Read the Call For Donations for more information.